Off the U.S. Pacific Northwest coast, the 680-mile-long Cascadia subduction zone has produced giant earthquakes and tsunamis like the one that ravaged Japan last year--the most recent, in 1700. These quakes are thought to come every several hundred years. To help understand subduction processes along this zone, scientists at sea and on land are conducting the first-ever imaging of an entire plate-the Juan de Fuca-from the ridge where it is growing, to the trench where is diving under North America. Aboard the R/V Langseth and R/V Oceanus scientists will study how fluids, sediments and the structure of faults may influence the evolution of this seismic zone, and the frequency and power of earthquakes, as well as volcanoes that erupt inland. 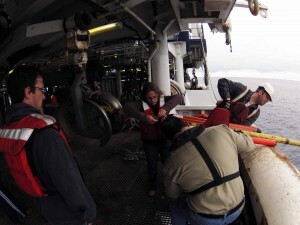 Team: Marine geophysicists from Lamont-Doherty Earth Observatory, University of Wyoming and University of Nevada. The RV Langseth is continuing work in the Cascadia subduction zone region with the COAST (Cascadia Open Access Seismic Transects) project. We are a scientific team of 20 scientists currently aboard the R/V Langseth, acquiring seismic images of the Cascadia subduction zone. Through our work we hope to provide new insights on the position and structure of the plate boundary between the downgoing Juan de Fuca plate and the overlying North American plate. This plate boundary is unusually enigmatic, because it produces fewer regular earthquakes than most subduction zones. Tsunami and paleoseismic data suggest that this subduction zone is capable of generating earthquakes up to magnitude ~9, so understanding the position and morphology of the plate boundary is important for obvious reasons. In addition, we’ll produce images of the mechanical structure and fluid pathways in the subduction system – all of which provides important information on seismic hazards and subduction processes. 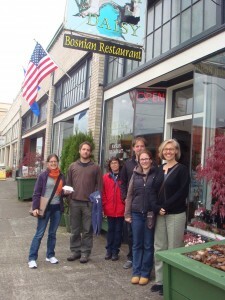 You can read more about the science on our blog at http://cascadiaseismic.blogspot.com …But here I’d like to introduce you to our team and a few of the unique aspects of our project. This project was originally conceived at a community workshop held in Incline Village, Nevada, two years ago. At that meeting, the marine seismic community brainstormed on ways to make our data more open and accessible to a broader range of stakeholders (students, researchers, teachers, and the public at large). One part of the strategy adopted at that workshop was to support open-access data sets, acquired on open-participation cruises. This cruise is a first step in that direction. What’s unique about our project is (1) cruise participants were selected from open applications, and (2) both the raw and processed data we produce will be immediately publicly released, so that anyone can use the data (including writing proposals to work on the data). The shipboard science team consists of three of the PI’s (Steve, Katie, and Graham), plus a crack squad of 17 students, postdocs, and young faculty from around the country. (The PI’s have taken to calling these participants the BYT’s, or Bright Young Things.) Those folks will be introducing themselves to you through this blog, but I can tell you that we have participants from fourteen different organizations (twelve universities and two different USGS offices), comprising 13 graduate students, 2 postdocs, and 5 faculty. The Lamont folks tell us, with feigned enthusiasm, that we have set a record for the number of cruise participants (55 in all): we’ve filled every bunk on the ship. Fortunately it’s a short cruise (12 days)! On our blog we’ll talk about the science we’re doing, introduce the Langseth, show some initial results, and hear from our BYT’s. Give it a visit! The science team an hour before sailing, July 12, 2012. Left to right: Mike Martello (NCS Subsea), Jay Johnstone (LDEO), Graham Kent (Univ. of Nevada), Danielle Sumy (USGS-Pasadena), Janine Buehler (Scripps), Shahar Barak (Stanford Univ. ), Brady Finchum (Univ. of Nevada), Annie Kell (Univ. of Nevada), Jackie Caplan-Auerbach (Western Washington Univ. ), Will Fortin (Univ. of Wyoming), Marie Salmi (Univ. of Washington), Kate Allstadt (Univ. of Washington), Jeff Beeson (Oregon State Univ. ), Dara Merz (Western Washington Univ. ), Rob Anthony (New Mexico Tech), Katie Keranen (Univ. of Oklahoma), Steve Holbrook (Univ. of Wyoming), Emily Roland (USGS-Anchorage), Brian Covellone (Univ. of Rhode Island), Dalton Hawkins (Univ. of Oklahoma), Harold Tobin (Univ. of Wisconsin), and Ashton Flinders (Univ. of New Hampshire). 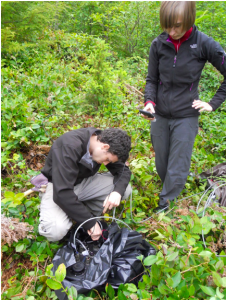 Seismometer installation: Zach checks cables, Helen programs the data logger. A sensor is in the ground behind Zach. While the R/V Langseth plies the waters offshore the Pacific Northwest, we have been recording its source with seismic equipment on land. Lamont ran seismometers in Washington, deployed by two Columbia graduate students, Helen Janiszewski and Zach Eilon, and myself, and received some “logistical support” (shovels, batteries) from colleagues at the University of Washington. Anne Trehu of Oregon State led a parallel Oregon deployment. Like the Langseth, we are making use of national shared instruments; our gear comes from the PASSCAL Instrument Center in Socorro, NM, a facility of the Incorporated Research Institutions for Seismology and supported by the National Science Foundation. Writing this reminds me that modern science tends toward major collaborations; most field seismologists nowadays have to be masters of logistics. Much of my job was negotiating with myriad landowners to get permission to place our (small) equipment on their land, including timber companies, state agencies, civil safety organizations and even people with big backyards. Clearing trees– an unadvertised skill for seismologists. Our sensors record the same seismic signals as the ocean bottom seismometers the R/V Oceanus deployed, and we will combine the data later. They can detect Langseth signals up to 100 miles inland! This is something extraordinary, and difficult to believe until seen. 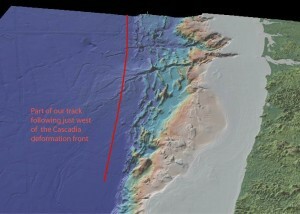 The on-land data allows the project to extend over and past the fault zone that underlies the coast off Washington and Oregon, the Cascadia Megathrust. While the existence of the fault has been long recognized, growing evidence suggests that this fault is building up strain, and is capable of generating great (magnitude 9) earthquakes. Still, unlike most other subduction zone faults there are almost no small earthquakes on it, and so we know relatively little about it. The signals from the Langseth will reflect off the fault, at 15 – 20 miles depth near the shoreline, and be recorded on the seismometers we deploy farther west. The reflections should tell us a great deal about the thickness and internal structure of the fault zone, and the nature of the rocks on either side. While we cannot predict earthquakes, these data help test physical models of what active faults are like deep in the earth where we cannot otherwise see them. The front half of the Langseth deploys seismometers at sea while my giant Suburban does the same on land. In mid-June we recorded data in Washington from the Langseth far offshore, and in early July the Oregon group did the same. The Washington work should be completed in a second phase in mid-July. All of this means lots of trips and a good deal of time driving between the Washington beaches and the Mt Rainier foothills. Most of our sites are in recent clearcuts accessed via logging roads, so we can avoid large trees that occupy the rest of the Northwest (they shake the ground too much and block GPS signals). 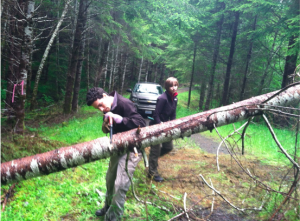 The clearcuts are old and the roads are not used much, so we spend much time clearing branches and cutting small trees that fell across the road to get to our sites. My students did not expect they would be lumberjacks when they came to grad school in New York! 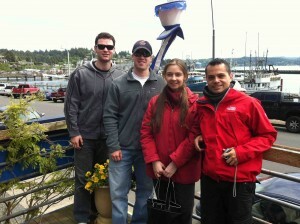 At the end of the first deployment we met the Langseth in Astoria. We had been driving the biggest SUV that I could find – a large Suburban capable of carrying seismic equipment, big batteries, tools, and people, over any road. Nevertheless, next to the Langseth, the Suburban is very small. Stepping across the shoreline to do science clearly requires a whole other scale of operation. Geoff Abers is associate director of the Seismology, Geology and Tectonophysics division of the Lamont-Doherty Earth Observatory. A rack of Ocean Bottom Seismometers on deck. 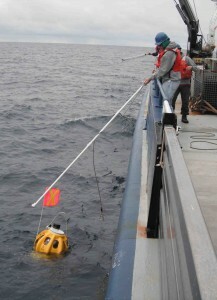 As part of our study of the Juan de Fuca plate from its birth at the mid-ocean ridge to its recycling at the Cascadia subduction zone, the R/V Oceanus has the task of conducting Ocean Bottom Seismometer (OBS) operations and oceanographic measurements: this is done in close coordination with the R/V Langseth, which tows the high-quality sound source used to generate the waves that the OBS listen to. 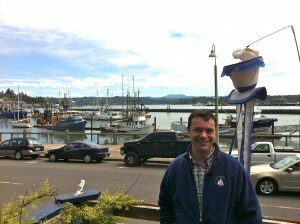 Chief Scientist Pablo Canales prior to departure from Newport. 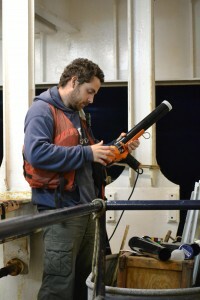 The Chief Scientist Pablo Canales from Woods Hole Oceanographic Institution, three graduate and undergraduate students from Boston College, CSIC Barcelona in Spain, and Dalhousie University in Canada, and myself from LDEO boarded the ship at the Oregon State University Hatfield Marine Science Center on Yaquina Bay on sunny June 6. The two teams of OBS engineers from Woods Hole and Scripps Institution of Oceanography were onboard, and all the ocean bottom seismometers had been loaded, some neatly aligned on racks on the deck, others stored inside a dedicated container. The CTD (conductivity-temperature-depth) instrument stood firmly secure on deck, wrapped in its protective bag. Looking forward to our departure the next morning, we enjoyed some delicious seafood meals onshore. Helene Carton and students in Newport. (Photo J.P Canales). The course of operations has us visit a series of eighty-five “sites” carefully defined ahead of the cruise, typically located about ten miles away from one another, identified as red, blue and yellow dots on the colorful map of the seafloor topography on display in the ship’s main lab. In between sites the ship transits at a speed of about 11 mph. 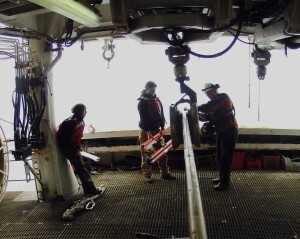 While at a site, we are either deploying an ocean bottom seismometer (dropping it off the side of the ship using a crane), interrogating it to get its precise coordinates on the ocean floor, picking it up using long poles equipped with a hook at the end, or sending the CTD instrument probe the water column all the way down to 20 meters above the sea bottom and then bringing it back up. 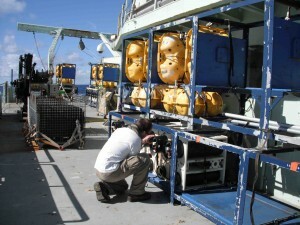 Deploying an OBS from the Scripps Institution of Oceanography from the Oceanus. Our small science team has been keeping itself busy, with duties involving helping with deployment and recovery operations on deck (and occasionally getting our pants and hard-toed shoes soaked! 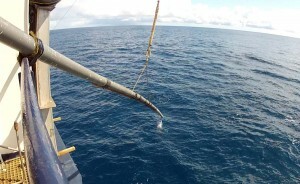 ), processing the CTD measurements to better understand the movements of water masses in this region of the NE Pacific, and taking a preliminary look at data downloaded from seismometers that, a few days ago, were still listening for sound waves at the sea bottom under 2000 meters of water. Recovering one of the Woods Hole OBS (Photo J. Mojica). Several times we have crossed paths with the R/V Langseth while she was towing equipment and recording data, and remained a precautionary distance of several miles away: in lieu of waving from the deck, watchstanders on one ship greeted watchstanders on the other ship through messages in our mutually-visible electronic logs! 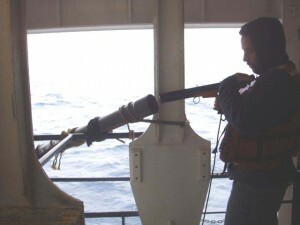 In the course of our time at sea so far, we have seen whales, seals, dolphins, porpoises, and birds. Towards the end of our first suite of CTD casts, the sensors got intruded by jellyfish, which resulted in some unusually wiggly signals. We have also seen (and sometimes picked up!) a variety of floating debris, perhaps from the tsunami that struck the Japanese coast in March 2011. After traveling through the Pacific Ocean such debris have started washing ashore on the beaches of Oregon. Our adventure at sea continues until July 14 (after a brief port stop in Newport conveniently timed to coincide with the July 4 holiday! ), with the final recoveries of all the OBS. New findings! 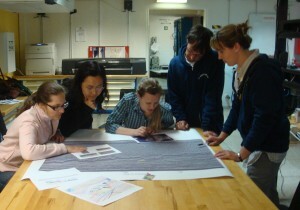 A group of us discussing the last seismic section we just collected. Heading west from coastal Oregon we are able to make our initial seismic images beneath the seafloor continuously as we go. Where once our data would have been recorded on magnetic tapes only to be analyzed long after the expedition was over, thanks to the wonders of modern signal processing, we can now make images almost immediately as the signal is detected at our hydrophone receiver array. For most of us looking at these images, all the action begins at the seafloor and below. But there is the whole deep ocean above and for some members of our science team, this is the primary subject of interest. Guillermo preparing to launch an XBT. Berta Biescas from Dalhousie University and her student Guillermo Bornstein will be using the seismic data we are collecting to study the ocean currents that circulate within the water mass above the Juan de Fuca plate. Within the Cascadia Basin, as this region is known to oceanographers, the great eastward flowing North Pacific Current arrives from the other side of the Pacific Ocean, and is deflected by North America, splitting into the north flowing Alaskan Current and the south-directed California Current. These water movements lead to upwelling along the coastal zone of nutrients from the deeper ocean that then supports the abundant marine life of the region. Loading the XBT into the launching pipe. With the high density of our soundings and the high fidelity of our recordings we can actually image reflections within the ocean that arise from small changes in temperature and salinity associated with these currents and upwelling water masses. To help understand these reflections, we are taking very closely spaced measurements of the temperature and salinity of the ocean using eXpendable Bathy -Thermograph probes. Every 10 minutes along our track Berta and Guillermo load up the XBT launcher and send one into the ocean. As the probe descends through the water column it relays back to the ship measures of temperature and salinity. The XBT is launched through a 25 ft long pipe extending off the port side of the ship. 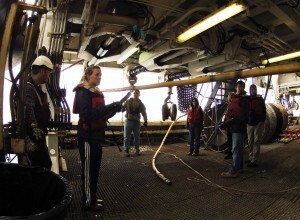 The pipe ensures that the probe enters the water (splash in photo) far enough from the ship to avoid tangling in the seismic gear. A good XBT is a deep one – some record to estimated depths of 2000 meters below the sea surface, two thirds or more of the ocean depth in this region. Later these measurements, along with other data from our cruise, will be sent to national data centers, where they may be used for additional studies, contributing to our knowledge of the temperatures of the global ocean. The streamer cable reels by as a crowd on deck watches. (Greg Horning). Yesterday we deployed one of the Langseth’s long hydrophone array cables and began the second phase of our survey. We looked forward to this with much anticipation. It’s outside work and at times requires some physical exertion, which we will not have much of on this expedition. 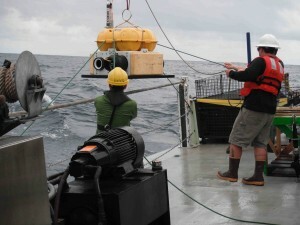 Most of the time our job is to be inside the main science lab, closely monitoring the recordings that come in from all of the instrumentation that is running continuously as we traverse the ocean. 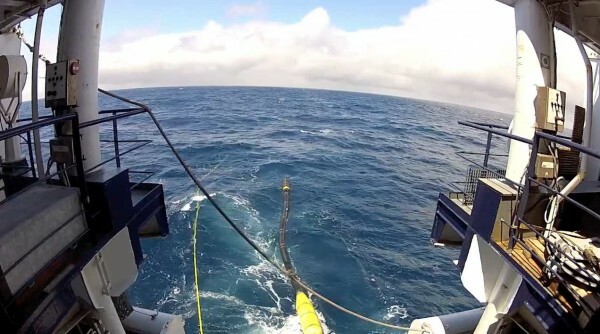 As the streamer is deployed "birds" with remotely operated wings are attached at regular intervals and will be used to keep the streamer submerged 10 meters beneath the sea surface (Greg Horning). Up to now we have been sending soundings to the 47 ocean bottom seismometers that the Oceanus deployed early last week. 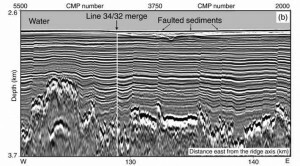 The multi-channel seismic data we are acquiring in this next part of our study provide x-ray like images of remarkable resolution of horizons and faults in the sediments and crust beneath the seafloor. To construct these images we are towing one very long (over 8 kilometers!) streamer cable behind the Langseth containing 636 listening devices, or hydrophones. Each hydrophone records the return echos from all of our soundings. By adding the signals from each of these records, we are able to enhance reflections and see very fine-scale structures. The x-ray like images we are collecting show the faulted sediments overlaying the Juan de Fuca plate. We began our first survey line near the Endeavour Ridge, part of the volcanic Juan de Fuca ridge that lies hidden beneath the ocean only 400 to 500 kilometers offshore. At this ridge, the Juan de Fuca plate is continuously replenished with the eruption and intrusion of magmas from the earth’s mantle. Now we are transiting away from the ridge imaging continuously as we go. When we reach the easternmost end of our line where the plate begins to dive under North America, we will have imaged the deep structure across an entire continuous transect of an oceanic plate for the first time! One of the aims of our study is to understand how the Juan de Fuca plate changes as it ages and moves slowly toward the trench. Starting at birth and driven by heat from molten magma that lies under the Juan de Fuca ridge, seawater circulates through and reacts with the oceanic crust, altering its composition and structure. In this way seawater becomes incorporated into the oceanic plate. This process continues on as the plate ages in ways that are not well understood. Then when the plate dives back into the mantle beneath North America, this water is released and contributes to many subduction phenomena, including the properties of the fault interface where the great earthquakes occur and the formation of the magmas that periodically erupt at the Cascade volcanoes of the Pacific Northwest. The Langseth will image the subduction zone off Washington, Oregon and British Columbia that is capable of producing megathrust quakes. Off the coast of Washington and Oregon, the Juan de Fuca plate dives under North America, slowly descending back into the mantle from which it was formed only 8 to 10 million years ago–very young in the context of earth history!. As the plate descends, stresses accumulate within the fault zone dividing these two tectonic plates which will eventually result in a large megathrust earthquake like the devastating Tohoku earthquake offshore Japan in 2011. In the research expedition now underway, we will investigate the plate before it disappears under North America to understand why earthquakes happen where and when they do within this Cascadia subduction zone. During our cruise we are using sound to probe the sub-seafloor, to generate images that tell us about the properties of the oceanic crust and mantle that lie beneath. Our soundings can penetrate through the several kilometers of sediments that cover the Juan de Fuca plate, into the 6 kilometers thick crust and below, into the upper part of the earth’s mantle. 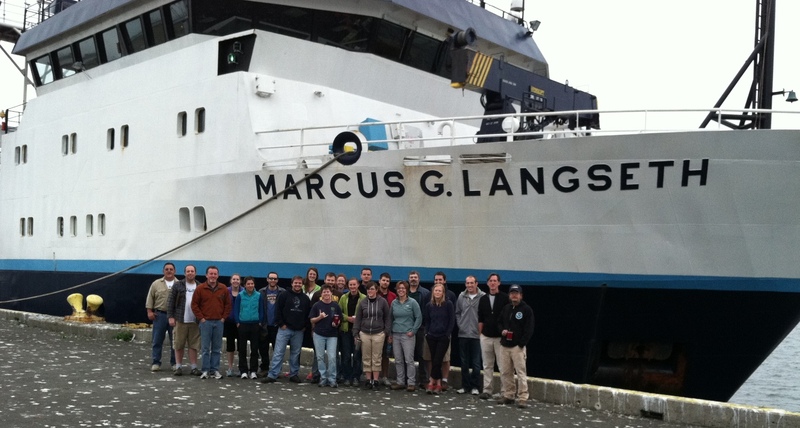 Students and scientists (Suzanne Carbotte, far right) before departing Astoria, Ore.
Our ship, the R/V Marcus G. Langseth, is one of 25 research vessels available to U.S. scientists for oceanographic research. 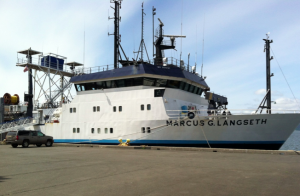 The Langseth is unique among the research fleet, equipped for advanced seismic imaging, with a high quality sound source and long arrays of listening devices, or hydrophones, which trail behind the ship listening for the echos returned from the seafloor and below. Our program is complex. Part of our science team is on a companion ship nearby, the R/V Oceanus, deploying ocean bottom seismometers, which are also listening to the Langseth’s soundings. On land, just prior to our cruise, a series of seismometers were set out by our colleagues in the mountains of coastal Oregon and Washington to also record our soundings. With these arrays, extending hundreds of kilometers offshore and onshore, we hope to see deep into the subduction zone in two regions with quite different properties, one along the Washington margin where there are relatively frequent small magnitude earthquakes ,and the much quieter central Oregon margin. This expedition features a cast of scientists and graduate students from the U.S., Canada, France, China, Spain and Serbia. We are accompanied by expert science technicians who deploy the advanced seismic equipment, marine mammal observers who let us know when marine mammals are nearby, and the crew who ensure the safe operation of our ship, day in and day out, for the 26 days we will be out on the cloudy Northeast Pacific.